Q: How do you assess the present political situation and plan to overcome the challenges lying ahead? A: Mainly, there is a serious economic crisis brewing in the country. The economic growth, sustained over the past years, has slowed. It is a challenge to rejuvenate it now. Then, the soaring cost of living, triggered by the budget deficit, is a serious matter. Thousands of persons have been thrown out of employment due to the termination of mega, medium and small development projects. The income levels of tea and rubber holders and paddy cultivators have dwindled. The rupee has depreciated against the US dollar, taking a heavy toll on the economy.It is difficult to instill confidence in the private sector as a result. Internationally, the war crimes charges are being pressed. Likewise, the separatist elements, acting in connivance with certain sections of the international community, have become forceful in their demands against the interests of the country. It is a fresh challenge to ward off the renewed pressure from these secessionist forces. According to my understanding, a new Cabinet headed by a Prime Minister with competence to overcome these emerging challenges, should be elected immediately. At the next election, the country’s vote base is slated to be divided into two factions in terms of their voting patterns. 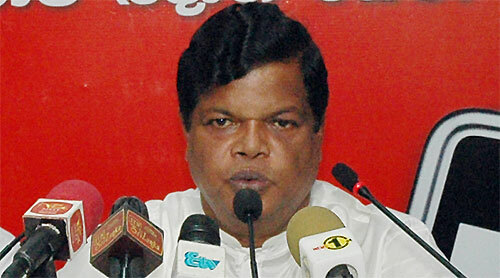 One segment will side with the pro-western, camp led by the United National Party (UNP). The other is the camp of the progressive forces united against the UNP-led front. We represent the anti-UNP camp. The Sri Lanka Freedom Party (SLFP), Mahajana Eksath Peramuna (MEP), Lanka Sama Samaja Party (LSSP), Communist Party, Sri Lanka Mahajana Party and DesaVimukthiJanatha Party are in it. We strive for a government formed by a coalition of these parties and led by Mahinda Rajapaksa as the Prime Minister. The executive arm of the government is represented by President Maitripala Sirisena. The President has to decide whether to opt for a Maitri-Ranil administration or a Maitri-Mahinda administration. I am a person with experience in working with both of them. So, I believe a Maitri-Ranil administration is not a compatible combination. The President can do a better job of governing with Mahinda Rajapaksa because they are compatible with each other in terms of their political background and culture. Q: In your answer, you mentioned the suspension of development work. The government has said that it is due to a lack of proper allocation of money in the budget under the previous regime. How do you respond? A: The budgetary allocations are available to make payment for constructions completed the previous year. It is the routine procedure. For example, the Education Ministry allocates money from this year’s budget to pay for uniform materials purchased during the previous year. It is the same with the printing of textbooks. Annually, our government used to make an external borrowing of one billion US dollars through a sovereign bond issue. The previous government did it for seven years. The Presidential Election was conducted on January 8. We had planned to issue a sovereign bond to raise 1.8 billion US dollars had Mahinda Rajapaksa won. By January 20, we were to pay US $ 500 million for the bonds that had matured. Then, we were planning to have one billion US dollars left with us. Then, it would not have become a problem to make payments for work completed or to be completed this year. But with the formation of the new government, both the Finance Ministry and the Central Bank ran into a crisis without funding sources. The Central Bank should always be under the purview of the Finance Minister. But it is different this time under the new government. In the interim budget, there were populist measures- the increase of public servants’ salaries by Rs.10, 000. It can be a good election gimmick like selling a loaf of bread at Rs.3.50. It is good if the government can increase the salaries by Rs.10, 000. Yet there was no increase of basic salaries. With hostility towards certain segments, the government imposed certain taxes. Super Gains Tax, Mansion Tax and some excise duties have been imposed with hostility towards certain companies and individuals.Six months has elapsed, but enabling legislation has not been passed in Parliament to give effect to them. Q: In your view, what are the reasons for the government not to enact legislation to give effect to these taxes? A: The government is driven by personal vendettas. So it started a merciless witch hunt against individuals and organisations. It does not know whether it is feasible to apply such tax measures in the real economic context. Driven by animosity, the government targets not only the individuals who played a role in the elimination of terrorism, but also the countries that assisted Sri Lanka in it. During the war against terrorism, countries such as the United States and England never stood by us. But, China and Russia stood by us. The government never cared for the traditional friendship we maintained with that country. They suspended the port city project. Many other Chinese small scale projects were also affected. Recently Chinese President Xi Jingpin went to Pakistan and decided to invest US $ 46 billion under the One Road, One Belt Concept. Next, he signed agreements with Indian Prime Minister Narendra Modi for investment of US $ 22 billion. We lost our investment of US $ 1.4 billion. We have been the victim of a strategic international ploy. Q: Now that you have embarked on a mission to bring back Mahinda Rajapaksa as the next Prime Minister, how realistic is it now? A: Going by the ground realities, we are certain that the United People’s Freedom Alliance (UPFA) cannot attract voters without Mahinda who is seen not as a mere politician but as a national hero. We have seen politicians, but we have never seen a politician being embraced by the people in this manner in the aftermath of his defeat. I know about former Prime Minister the late Sirimavo Bandaranaike. After her defeat, she did not attend May Day rallies for three years. We, as the members of then opposition, could not gather people for a meeting. But for Rajapaksa, the situation is different. This is the difference between an ordinary political leader and a national leader. Some of our typical political theoreticians cannot understand this. But ordinary village people can notice it. Q: But, there are indications that he will not be given nomination by President Maitripala Sirisena to contest from the UPFA? A: The mass wave of public support may prevail upon the President to act differently. There are invisible forces behind President Sirisena. These invisible forces also try to entrust the SLFP fully to President Sirisena. Yet it is not the reality. If nomination is denied, Mahinda Rajapaksa will contest definitely from a different alliance. At least 30 MPs will team up with him no matter what the election result is. Some SLFP MPs holding ministerial posts will be compelled to join us. In 1956, the country witnessed a wave of support for a political movement that emerged. At that time, S.W.R. D. Bandaranaike contested under the symbol of Mahajana Eksath Peramuna (MEP) as he was unable to establish his own party. In that election, nominations were given to novices in politics. In 1978, a similar wave of support emerged in favour of late President J.R. Jayewardene. At that election, a great political figure of the calibre of N.M. Perera was defeated by a contractor turned politician in the Yatiyantota area. Again, former President Chandrika Bandaranaike Kumaratunga had a wave of support in similar fashion. At that time, we were the stars of the opposition. We were politically washed out by it as we stood against it. Mahinda Rajapaksa never had a wave of support emerging suddenly. He won under normal circumstances only. In 2005, he won by a small margin. After the war victory, he won by 1.8 million votes. Now there is a silent, but steady wind of support blowing across the country in his favour. Q: But, he was defeated at the last presidential election. Rampant corruption, nepotism and the breakdown of the rule of law were the main allegations against him. How are you going to address such concerns? A: It is not necessary to make special public addresses to counter these allegations. People in their consciousness, realise it. The Foreign Affairs Minister had said that US $ 18 billion was squandered. Educated, rational people know that whenever at least US $ 100,000 is deposited elsewhere in the world, it is accounted for. Everything is computerised. Q: Then, what about the allegation about family rule? It is not an issue this time. Mahinda Rajapaksa is contesting for the post of Prime Minister. The PM has no power to interfere with other ministries. As for the rule of law, it has deteriorated more than ever today. The legal fraternity also raises concerns about it. During our time, we also did certain unacceptable things. A: We could have given a pardon to Field Marshall Sarath Fonseka when he was convicted by a court martial. Only the court martial decided the punishment. We cannot do anything about it. A presidential pardon could have been given to him at an early stage of his imprisonment. Besides, those who appeared as close confidants and eulogisers of Mahinda Rajapaksa, misled him for their own ends.